The Mexican National Miners’ Union (Los Mineros) is challenging the results of a union representation election at the Finnish-owned PKC auto parts factory in Ciudad Acuña, Mexico. 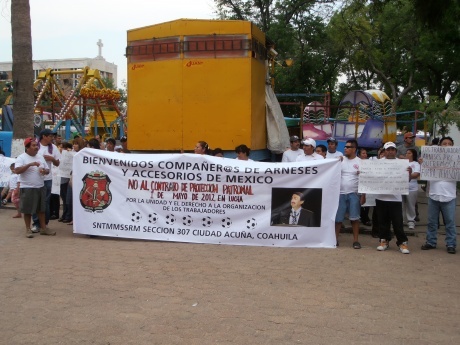 According to the official count, Los Mineros narrowly lost the vote – 2,311 to 2,509 – to a “protection union” affiliated with the Confederation of Mexican Workers (CTM) that was supported by the employer. “If the process had been transparent and legal, Los Mineros would have won without a doubt,” says Julia Quiñonez of the Border Workers’ Committee (CFO), which has been providing advice and support to the PKC workers. She points to a number of anomalies on the day of the election, including the company listing approximately 2,000 workers “inactive,” allowing ineligible employees (engineers, administrative staff, supervisors) to vote, not allowing votes to be counted openly, and denying the union committees the right to review voters’ credentials. She also notes that the employer had rehired a number of workers two weeks to a month prior to the election in order to have their votes included. Now that the election is over, those workers are no longer employed by the company. In addition these examples of blatant election-day fraud,in the months leading up to the vote, PKC management was actively and openly favouring the CTM and harassing and threatening Los Mineros supporters. According to Los Mineros, CTM delegates were given free reign of the factory and allowed to hold captive-audience meetings with the workers, while representatives of their independent union were denied entry. The employer openly expressed its support for the CTM, telling the workers that they should vote for the “official union” for their own good and for the good of the company. There were constant threats that the factory would close and workers would lose their jobs if Los Mineros won the vote, threats that were repeated in all the local media.